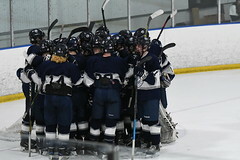 Yarmouth dropped a close 4-2 contest to Gorham and will now face a number of must-win divisional games over the next few weeks. On Wednesday, the Clippers will host Class A powerhouse St. Dom’s at 4:50 pm and on Saturday the team will travel to UNE to face Kennebunk/Wells. The Clippers came out flying on their first shift, but Gorham responded and outshot Yarmouth 13-7 in the opening period. 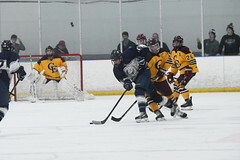 However, as has been the story throughout the season, Charles Henry Watson ’22 played extremely well in net and the teams went into the locker room with a scoreless tie. The tie would not be broken until 3:06 in the second period when Kurt Heywood ’19 caught the Gorham net-minder cheating off the post and riffled a short-side, top-corner shot to give Yarmouth the 1-0 lead. Spencer King ’20 and Matt Sanborn ’19 picked up the assists. In the third period, Gorham scored back-to-back goals in a span of less than one minute, but Kurt Heywood evened the score with another short-side shot that caught the Gorham goaltender cheating to the center of the net. 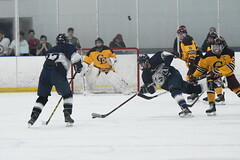 Matt Robichaud ’22 was credited with the assist on Heywood’s second goal of the game. Heywood fires on net for his second goal. With 5:20 remaining in the game, Gorham scored what would prove to the game-winner and the Clippers were not able to even the score in the closing minutes. Gorham added an empty-net goal to seal the victory. Charles Henry Watson stopped 27 of 30 shots in the loss. In earlier action, the Yamouth-Freeport Girls Varsity beat Gorham 3-1.